Dixon Water Foundation wins land stewardship award for holistic management. When Casey Wade stepped onto the high desert grassland of Mimms Ranch in West Texas, he found the ground as hard as asphalt and dusty beneath his boots. The land was balding, its carpet of greenish-blond grass receding, leaving parched bare patches sprinkled across the rolling desert plains. That was in 2010. The 11,000-acre parcel had just been purchased by the Dixon Water Foundation, a nonprofit organization dedicated to cultivating healthy watersheds through sustainable land management. 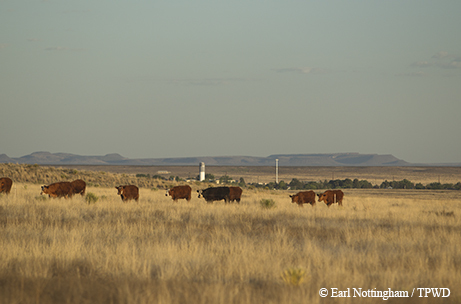 In the following years, Wade and the other members of the small foundation set to work to restore this land to its natural state — the short-grass prairie environment that dominated this part of West Texas before the arrival of European settlers. Their management system, called adaptive multi-paddock grazing, used only one tool: livestock. By moving cattle frequently from one small pasture to another, allowing the vegetation time to recover, the ranch managers cultivated the growth of healthy prairie grasses and improved the soil so much that a creek, dry for decades except when swelled by torrential runoff, began once again to flow more consistently through the property. Seven years later, thanks to the Dixon Water Foundation, the land is thriving. This year, the foundation’s hard work gained national recognition by winning Texas’ top conservation honor: the Leopold Conservation Award. The Sand County Foundation, a national nonprofit land conservation organization, presents the $10,000 award to one rancher or organization each year in honor of conservationist Aldo Leopold. Unlike past Texas honorees, the Dixon Water Foundation is not an individual landowner but a nonprofit organization focused on the bigger picture of Texas’ land health. The Dixon Water Foundation began in 1994, the passion project of the late Roger Dixon, a longtime rancher and conservationist. The first ranch the foundation acquired was the Leo Ranch in Cooke County; it now manages six ranches in North Texas and West Texas, using the land as an example of how regenerative land management can improve the health of soil and watersheds. The Dixon management techniques produce many benefits. Because a large number of Texas ranchers already have cattle, the foundation’s strategy of using livestock as a management tool makes the system attainable for the average landowner. The foundation has always made the financial side of its ranching operations a priority — not only is its method environmentally sustainable, but it also makes a profit as a livestock operation. When Lance Irving, Leopold Conservation Award program director at the Sand County Foundation, visited Mimms Ranch for the first time, he was struck by the thriving prairie grasses on the foundation’s land. The Josey Pavilion is a "living building" and classroom. Driving by the foundation’s North Texas properties in August, it’s obvious when you enter Dixon land — on the roads bordering the Leo Ranch, field after field of lush prairie speed by, glowing sage-green with bluestem and Indian grass. Before westward-traveling colonists spread across North America, much of the U.S. was traversed each year by thousands of migrating bison. The animals trampled the ground and grazed down the vegetation, but they didn’t stay anywhere for too long. A herd would pass through briefly and then depart, leaving time for the grasses to regrow before they were grazed again. The foundation’s grazing system mimics this natural process. Instead of the widespread technique of continuous grazing, where livestock remain on a large area of land for extended periods of time, adaptive multi-paddock grazing keeps a large amount of cattle or other livestock on a small amount of land for a short period of time. The cattle graze widely and indiscriminately. And as they stomp the ground (breaking up the soil) and leave their rich manure, they stimulate deep root growth in existing plants on the surface. The land is then left to recover for up to a year. “That vegetation covering on the soil is absolutely essential to moderating the temperature of the soil, creating a condition where the microlife of the soil can thrive and do all the things that they do for us,” Potts says. One of the key duties of this teeming array of microorganisms — each teaspoon of soil contains several billion bacteria, fungi, nematodes and more — is to aggregate the soil so it retains more water. Another is to provide nutrients needed by grasses and other plants. The resulting thick covering of grass leads to a large amount of decaying organic matter in the soil. The soil holds, or sequesters, the carbon in the organic matter and keeps it out of the atmosphere while also retaining more water. Research by Richard Teague of Texas A&M University backs up the benefits of this method of grazing for building a prairie ecosystem that is healthy and balanced. In his long-term study on the Dixon ranches, he showed the pros of a holistic system for soil health and deep-rooted grasslands. 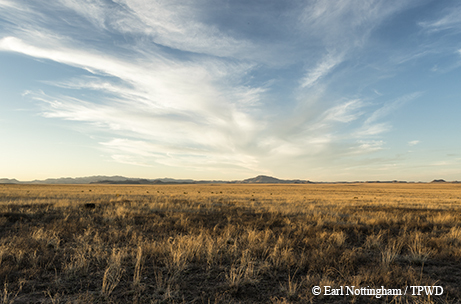 After years of work, prairie grasslands thrive at the Mimms Ranch. To the casual observer, it might appear that the foundation has accomplished its goal: healthy, green land, soil teeming with microlife and well-functioning watersheds. But the aim of the Dixon Water Foundation was always broader than that. The goal of the Dixon ranches, says foundation chairman Clint Josey, is to serve as examples of the benefits of sustainable land stewardship. Josey, who has been with the foundation longer than anyone else — he set up the backbone of the organization after Roger Dixon died in 2005 — says one of the most important parts of the foundation’s mission is its focus on education. Through grants and scholarships partially funded by the profits from the ranches, the foundation funds programs at colleges that offer range management degrees. Members of the foundation also host a variety of courses and tours on their ranches. 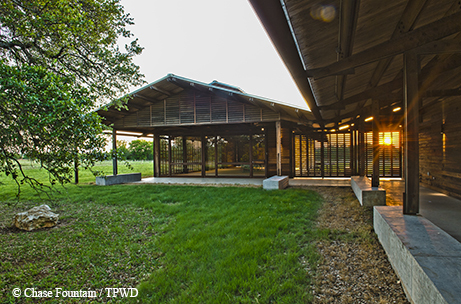 On the Leo Ranch, the Josey Pavilion, a highly sustainable “living building,” serves as a sort of outdoor classroom for adults and children alike. Casey Wade is quick to point out that for all its benefits, this system of management is not a fast and easy remedy for degraded land. Overall, though, maybe its long-term nature is what makes the Dixon land management system so effective.